With the 6 nations show down between Wales and England today its time to celebrate my Welsh ancestry! 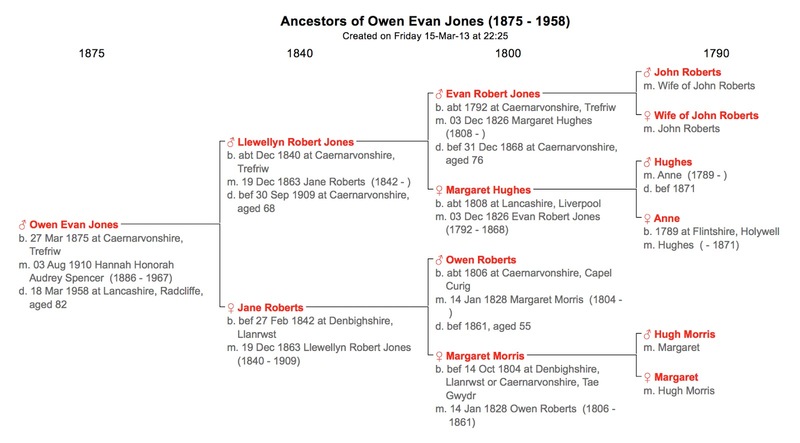 My great grandfather Owen Evan Jones was born in the town of Trefriw in the Conwy valley in North Wales in 1875. His father Llewelyn Robert Jones had worked in the wood yards and the iron works as well as a lime burner. It must have been a tough life in this part of Wales and Owen left sometime after 1891 as a qualified teacher. His father had disowned him for teaching English which was the only language allowed in the schools so he moved to Lancashire. Despite moving to England he was always proud of his Welsh roots and taught his grandson (my dad) how to pronounce the town of Llanfairpwllgwyngyllgogerychwyrndrobwllllantysiliogogogoch (and he can still say it!). It was partly the pull of this Welsh blood that led me to choose Swansea university and loved spending 3 years enjoying the culture and rugby!